Sweet and salty, chewy and crunchy – these potato chip pretzel cookie bars are the perfect one bowl, whisk by hand, crowd-pleasing party dessert. I mentioned on Tuesday that I was going to share some of my favorite football party-appropriate foods. Don’t worry – there are more dips and appetizers coming – but I thought we’d take a little time out today to talk about dessert. I’ve learned quite a few things over the years of hosting football parties, but the most important of all: make sure you have sweet treats to end the night! Pizza, wings, hoagies, dips – those are all great and should be part of your football spread. But dessert? There’s never a crumb left over. 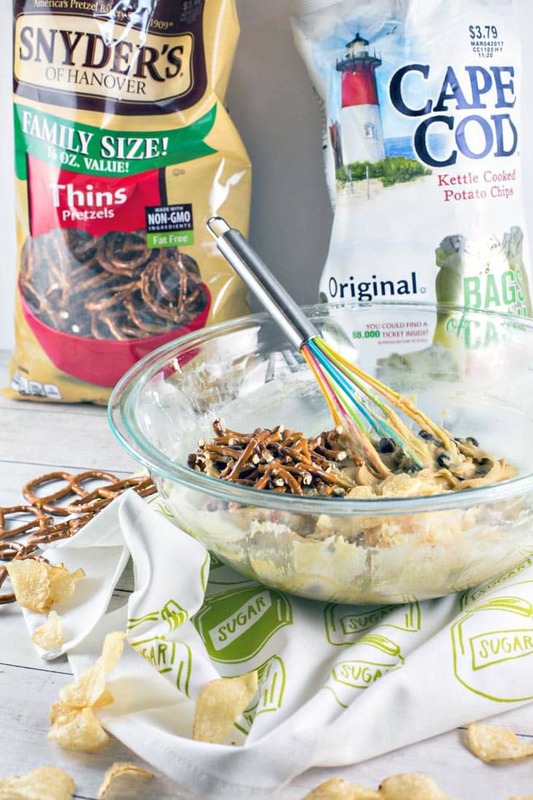 Since your football food already includes all sorts of salty snack food, why not tie that right into your dessert with some Potato Chip Pretzel Cookie Bars? Easy homemade chocolate chip cookie bars (one bowl! no mixer!) with pretzels and potato chips mixed into the batter and sprinkled on top, topped with chocolate drizzle. They’re sweet, they’re salty, they’re crunchy, and they’re easy to eat with one hand – it’s the perfect game day dessert. My husband picked up a bag of Snyder’s of Hanover® Pretzels and Cape Cod® Potato Chips in anticipation of a little football playoff gathering we had last weekend. Of course, I couldn’t just serve them as is (I mean, I could, but what’s the fun in that?) 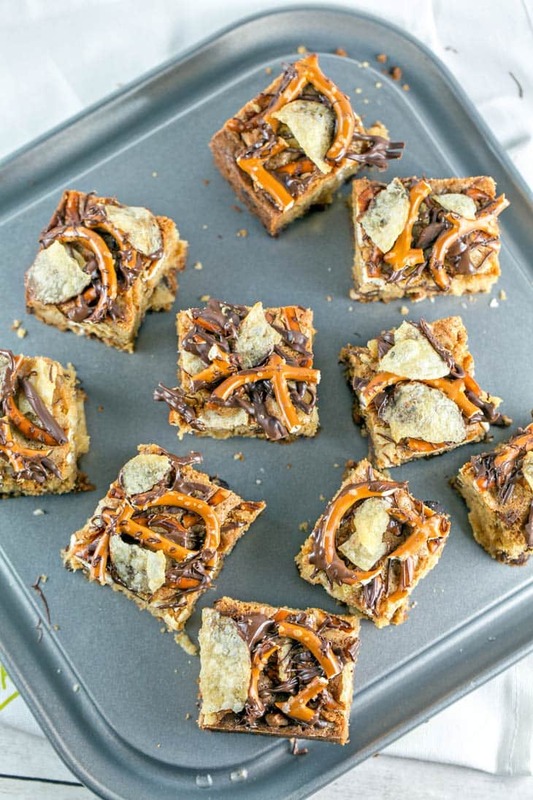 – so I turned them into potato chip pretzel cookie bars! 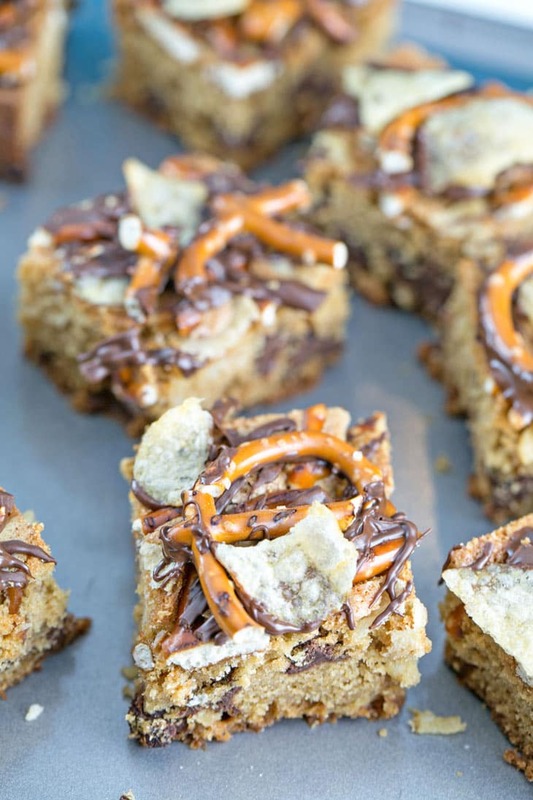 Let’s talk about the crunchy part of these potato chip pretzel cookie bars for a second. Or, more specifically, the lack of crunch in most pretzel-based desserts. 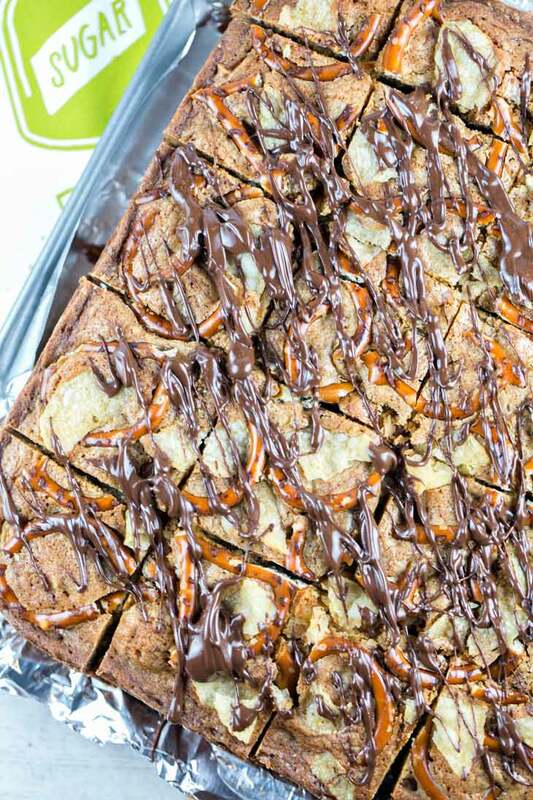 There are lots of cookie, brownie, and cake recipes out there with pretzels baked right in. They’re often called “pretzel crunch bars” or something similar. Except… if you bake a pretzel in something… it’s no longer crunchy. I know this, because I’ve tried. Over and over. And over again, with these – when I baked the layer of potato chips and pretzels on top. I can’t figure out why these baked pretzel cookies are so popular – the pretzels are soggy! They don’t look or taste like a pretzel anymore! So repeat after me: I will not bake the pretzels on top of the cookie bar. 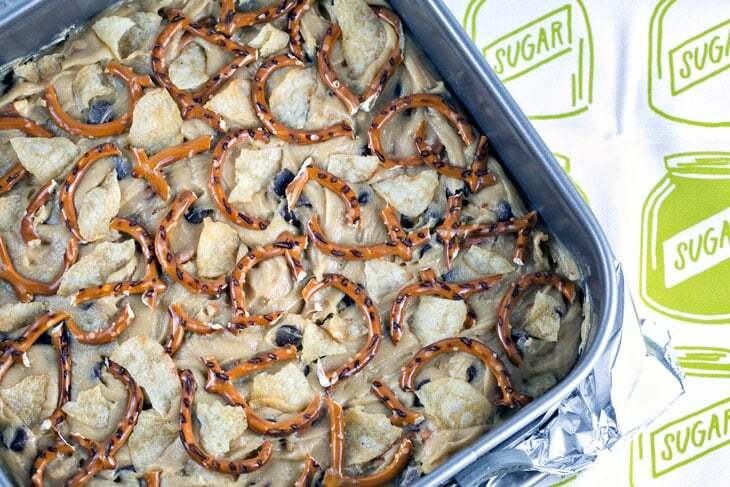 Instead, gently push the pretzels and potato chips onto the still-soft surface of the cookie bars when they come out of the oven. And then, because I really like crunch – we’ll put some more on top of the drizzled chocolate. A double layer of crunch, if you will. It’s so much better than baking the pretzels on top of the dough. Trust me. This is why I’m here – to save you from the mistakes I’ve made. 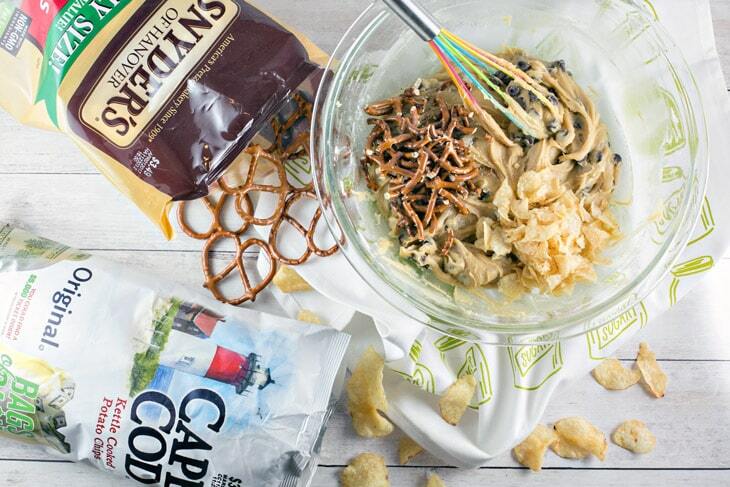 Potato chips and pretzels are the perfect snack for the game – and for dessert, too. 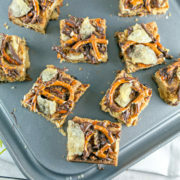 Everyone loves the salty/sweet combination, and the soft cookie bar with the crunchy topping is even more irresistible. Even if you’re not ready for some football, you’re ready to wow your guests at your football playoff party! And if you need any more ideas, be sure to check out these great recipes, using the rest of your bag of pretzels and potato chips! Preheat oven to 350 °F. Line a 9×9-inch baking dish with aluminum foil, extending the foil over the sides to form a handle, or along the bottom of a square springform pan. Lightly grease the foil. In a large, microwave-safe mixing bowl, melt the butter. Add in the brown sugar and granulated sugar and whisk until well combined and no lumps of sugar remain. Whisk in the eggs, one at a time, followed by the vanilla extract. Stir in the flour, baking soda, and salt. Mix in 1 cup of the chocolate chips. Gently fold 1/2 cup of the broken pretzels and 1/2 cup of the crushed potato chips. Spread the mixture into the prepared baking dish, smoothing the top with a spatula. Bake for 30 minutes, or until a tester inserted into the center comes out clean. Immediately after removing the cookie bars from the oven, press 1/2 cup of the pretzels and 1/4 cup of the potato chips along the surface. Cool completely in the pan. Melt the remaining 1/2 cup of chocolate chips and the vegetable oil in a microwave-safe bowl for 30 second increments, stirring well after heating, until smooth. Drizzle the chocolate back and forth along the cookie bars. Press the remaining pretzels and potato chips into the melted chocolate.